There are a number of ways to become a nurse in Australia. Australia recognises nursing education and registration from a small number of countries and colleges. Nurses who were educated in countries not recognised by Australian authorities will be required to undertake accredited Competency assessment courses in Australia. These courses must be conducted in Australian hospitals, and will vary in duration from 8 weeks to 3 years. 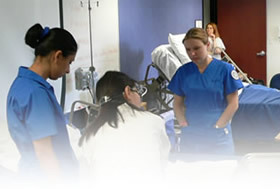 These courses are usually conducted by universities; however there are colleges who are accredited by state nursing boards who also conduct accredited courses. In order to understand which course will be required, we will submit your application for registration to the appropriate State Nurse’s Board, and if successful enrol you in the appropriate competency assessment course. The entire process can take from 3 months to 18 months. If you decide to use our services and we accept you into the program, you would normally be registered to work as a nurse in Australia within 6 months. This of course will depend on your qualifications and success in the Competency Assessment course. Once registered, we then apply for a working visa, and find you an employer who is willing to sponsor you for a 4 year working visa in Australia. Permanent residence can be applied for after 2 years on a working visa. It is possible to apply for permanent residence in the first instance, but you will still be required to attend a Competency Assessment program in Australia and you application will take from 12-18 months to be approved.